1. We aren’t just for Multiples. Despite the catchy name and our extensive client experience working with twins and even triplets, we have several families with one newborn who seek to have sleep at night and call upon our care to ensure that they get it. If you have 1, 2, or 3 babies, we can assist you to make sure you get the much-needed rest in the early weeks that you desperately need. 2. Infant Schedule, Routine, and Sleep Consulting is included in your overnight care. The saying goes that babies don’t come with an instruction manual. When you hire our expert team you can jump on the fast track of our favorite tried and true practices, products, and guidance along the way to minimize your trial and error efforts. We continue to give you support and tips (if you want them) as long as we are seeing you on a weekly basis. Not only that, but you will be able to have text and email support if you have a question on a day/night that we aren’t scheduled to see you. Many parents have said this is so valuable and cuts down the confusion and chaos of trying to sift through baby books that didn’t get read or trying to interpret the ones that were read. It reduces wasted money on products that aren’t exactly what they are looking for and adds clarity in implementing best practices. 3. You will get SLEEP. The best part about overnight nanny care is that we arrive and take care of everything for you so that you can get uninterrupted sleep. Eight hours of sleep while waking up 2-4 times, consciously listening as you fall asleep for the baby monitor in the background, or peeking over to check on your grunting, squirmy newborn is not at all the same as 8 hours of continuous uninterrupted sleep. Even with using a night nanny just a couple times a week, parents report such a difference in their clarity, ability to handle the next day (especially if there are toddlers and older siblings in the house), and overall physical rejuvenation. This sleep becomes especially important for any moms experiencing postpartum depression. Even if you have twins or triplets, we are confident and able to handle your babies on our own so you can rest easy. 4. We have several moms who breastfeed. It may seem like breastfeeding would make overnight help pointless. We have several moms who nurse, and we work with them to find the right arrangement for them and the baby. This means that some moms adjust their feeding schedule a bit, possibly use the aid of a pump, or have us assist in bringing the baby to her during the night, and then take over the burping, changing, and settling of the baby after the feeding is complete. 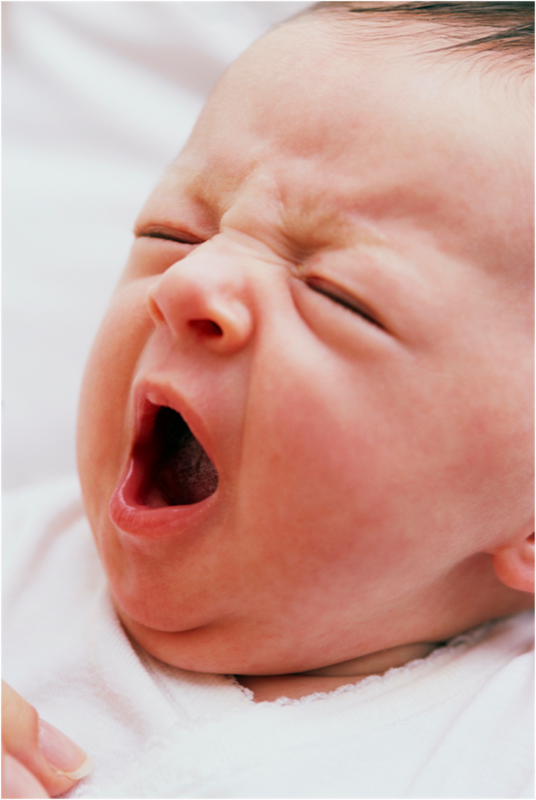 Most newborns have gas and often grunt, squirm, and need to take a few minutes to burp and get settled after feedings. This is especially helpful for mom because she can go back to sleep as soon as the feeding is done, and the nanny tends to the needs of the baby. 5. We are like family you can send away when you’re finished. I have found that parents love the idea of a night nanny but it can be intimidating to have someone you do not know in your home, and caring for your precious baby. This often keeps parents from pursuing care. While this is completely understandable, we are a lovely team of women who are passionate about infant care (all background checked and CPR certified) Our nannies have a nurturing and patient demeanor and extensive experience caring for infants. Our families quickly build confidence and trust in our ability, and it isn’t uncommon for parents to give us the garage code and have us let ourselves in when we arrive. Each family has a no obligation FREE consultation with me before any scheduled care. We also have several families that you are welcome to talk directly with as a reference about their experience using Multiples Made EZ. We want you to get to know us and feel comfortable with our service so that you can experience the tremendous benefit others have in getting rest and support during the precious early days with your newborn. Contact Multiples Made EZ for your no obligation free consultation today. What Makes a Perfect Nursery? Soon after many couples find out there is a baby on the way preparations start for the perfect nursery. 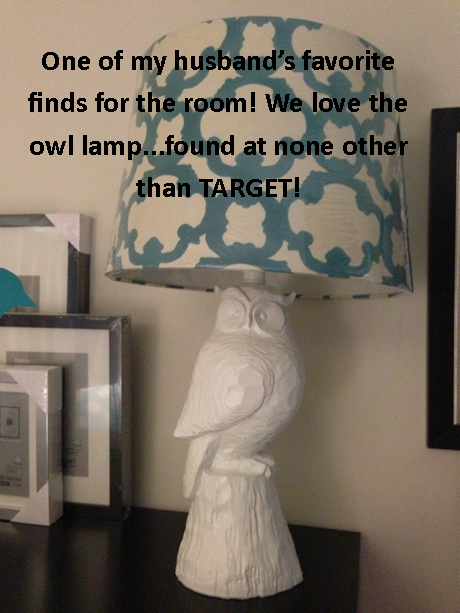 If you love design and shopping it can be tons of fun (especially with a large budget) if you aren’t into searching the web or the baby retail store for ideas it can seem very overwhelming. My work as a night nanny and infant consultant has given me the opportunity to work in several baby nurseries over the past several years. 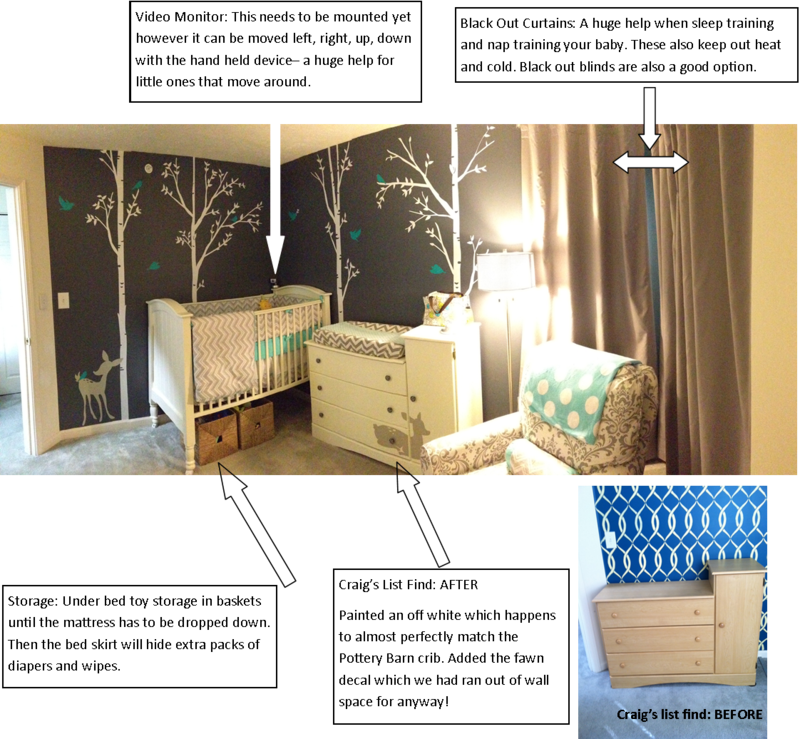 When we found out early this year that we were going to need a nursery at our own place I immediately began to start looking for ideas and I knew right away that it would require a few key elements which many new parents overlook while they are busy picking paint colors and bedding. Our nursery is very close to complete and will have a few final touches added once we find out if a boy or a girl will be joining us (Some pops of purple for a girl, and some lime green for a boy). We have done the near impossible and waited to find out what the gender is which can make doing a room even more of a challenge in some ways. We are so happy with the way our space has turned out and I hope that you will be able to more easily do your babies room, or add to it with some of these suggestions. My list of must haves: Black out curtains or blinds, video monitor, sound machine, comfortable chair and ottoman, and storage. Our room features: cool gender neutral colors that accommodate our style and go with colors that are in the rest of our home, wall decal set of birch trees, birds, and two fawns ordered from etsy.com (this completely made our room into the look and feel that it is. Easy to do and no need for a lot of expensive art work or wall hangings), a crib and mattress given to us from a friend, a Craig’s list changing table with storage that we gave a face lift to (we have never been afraid of DIY projects), baskets and IKEA storage that we repurposed from our former office, a comfortable and stylish swivel glider chair and ottoman (which was our splurge for the room) and one of my favorites, black out blinds that a friend volunteered to help with after I searched for the perfect fabric and color (I was picky) and came up with nothing! (Purchased black out fabric, and the grey fabric from Hobby Lobby for around $65 and I have 3 panels to cover my corner window). 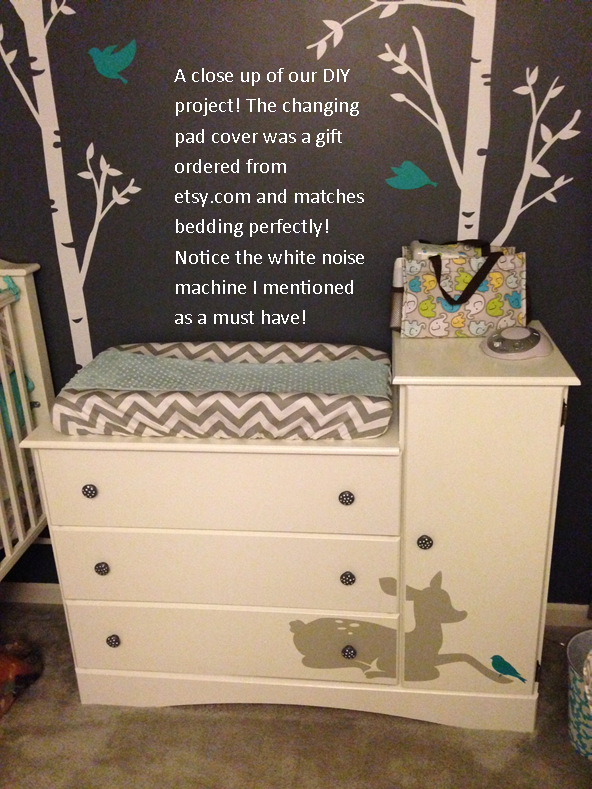 A few considerations: A nursery should serve the purpose of a peaceful, sleep inducing space for your child. 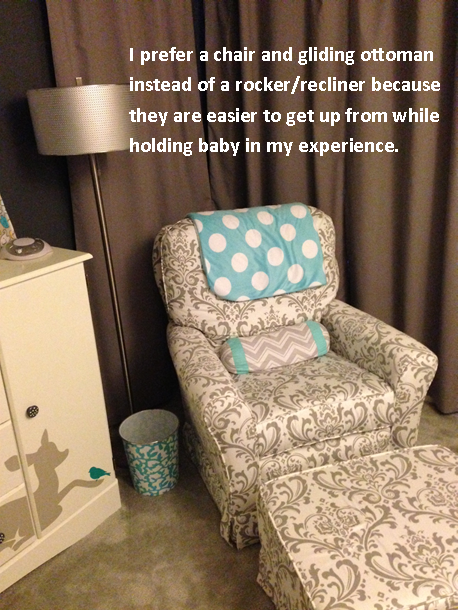 This is where baby will often be fed, soothed, and sleep the majority of the time. It often isn’t where children play, especially in the first year. Bright spaces, bold colors, mobiles, lights and music, toys and other distractions aren’t necessary to complete your baby’s nursery. Natural light is always good, but have a way to block it out especially during the summer. Colors and patterns are fun but a room as bright as the sun or as bold as a rainbow can be a lot. Have fun and enjoy the process of putting your space together. It will be a relaxing and inviting space that you will cherish time spent with your baby! Are parents and caregivers possibly hurting babies when they swaddle them? Swaddling infants has been used for centuries as a way to sooth babies and recreate the womb environment they are used to. Often babies sleep better and more soundly while swaddled and it makes putting a baby to sleep on their back a more comfortable position for them. However, when it isn’t done correctly (too tight, too loose, or too thick and warm of blanket) it can have negative effects. I specifically have met with each nanny on my team to ensure that they are confident in the correct swaddling technique and we also teach parents of newborns correct swaddle technique. MMEZ has successfully swaddled dozens of babies. After two California caregivers were arraigned on child abuse charges for improper swaddling, the topic is receiving some negative press. It is worth noting that “Social services discovered the inappropriate swaddling, along with multiple licensing violations, during an unannounced visit” to the facility where they were working. However, as even the American Academy of Pediatrics will state : “when done correctly swaddling can help calm babies and help them sleep better.” So lets teach ourselves, and others how to do it CORRECTLY instead of tossing the whole idea out altogether. There are any number of baby gadgets, equipment, and toys that we use for our infants which come with directions, or a number to call for questions so that it can use used properly and safely…this is no different. Dr. Harvey Karp is well known for his work in the area of newborn and toddler care. His work is well respected and something that Multiples Made EZ, LLC practices and teaches willing parents about. I have witness first hand the impact his teachings can have on newborns and their tired parents. In this article Dr. Karp addresses the simple steps that parents can take to make sure their infant is as safe as possible while sleeping. I n recent weeks my attention has come back around to the topic of probiotics. Commonly infant constipation, diarrhea or suspected formula sensitivity is what prompts the conversation and this case was no different. In working with many families over the years I am always surprised at the lack of information given to parents about probiotics for use in the whole family. Probiotics are beneficial bacteria that are found in the digestive track naturally and help keep various functions of your body in balance. Commonly people hear probiotics and think yogurt which is true but there is more to it than yogurt. Probiotics in food products or baby formula are good but should be thought of as a bonus, not your primary source. The amounts are often far too small to make an impact and lose potency during transport (almost all probiotic supplements must be kept refrigerated to maintain potency but there are a few that are shelf stable). I encourage all adults and parents to consider adding a probiotic supplement to your families’ health regime. It helps the immune system and can be a great preventative measure to help your body fight off sickness especially during fall and winter. The more strains and the more CFU (colony forming units) per serving the more it will cost but depending on your current health and other factors it may be worthwhile. Expect to pay around $15-30 for most probiotics. Adult probiotics are usually a capsule you take orally , children’s are generally a chewable or powder, and infants are a powder that dissolves in milk or baby food. There is a variety of products available and while I am happy to give you suggestions about what I have personally used I do not exclusively endorse any brand. While very few medical doctors will suggest a probiotic I have rarely come across those who are against their use. It is always good to discuss specific health concerns with a qualified health professional if you are unsure. Please click here to read the article from Parents Magazine and learn more about probiotics. Please note: The contents of this commentary are that of the author and are meant to be educational. The author does not intend to diagnose, prescribe for or cure any condition. Tired toddlers at risk for growing up grumpy? Many people will acknowledge the need for proper feeding and sleeping schedules for infants but often they overlook the true sleep needs of a toddler. Sleep is a somewhat individualized requirement but there are certainly guidelines to follow and better yet, results to consider. It’s common that I have moms of babies I have worked with tell me that their baby is like a new child after they implemented an age appropriate nap and sleep schedule. 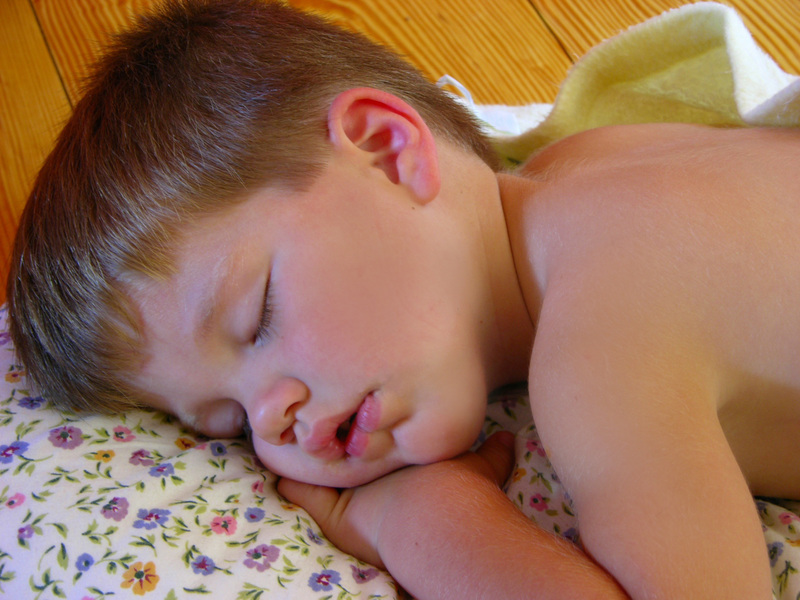 Often babies who develop good sleep habits and patterns turn into toddlers who have the same. Some parents think that their infant who doesn’t sleep well will mysteriously turn into an older infant or toddler who will…this isn’t usually the case. Of course there are the fortunate few who have their child’s sleep issues resolve with no real effort on their part but this is the rare case and not the usual sequence of events. If you have a baby right now or are about to I encourage you to start early working with your infant to meet their sleep needs. If your baby has already turned into a young toddler it isn’t too late but it can be a bit more challenging to change the habits and patterns of a toddler than to guide an infant to an age appropriate sleep schedule. Click to view this article which references a study done looking at tired toddlers and their moods. Study: Should Parents let babies cry it out? It’s a question that most parents struggle with. When it comes time to teach your baby to fall asleep alone and sleep at night without your continued rocking, bottle feeding, etc. how is the “best” way to do it? Fortunately Multiples Made EZ has had experience helping parents establish timely and healthy sleep habits for infants so that this process involves minimal crying. In fact there are some infants who are able to fall asleep alone with NO CRYING after their parents have been taught a few sleep training tactics and they have practiced them regularly. When sleep training is started too young it is ineffective and when it is started too late it becomes more challenging and usually takes longer. The good news is that even with some crying involved there is not thought to be any negative side effects for your infant according to the study and the result is likely to be a better rested mom and baby! Click here to read the article and study!